I’ve recently been revising my novel Indian Summer to add more conflict and mystical experiences. The story is about how Marcie tries to stop development of an old growth forest on the lake where her grandparents live. A few weeks ago I went to a film festival sponsored by the Indiana Forest Alliance and connected with the Development Director, Sandra Messner. We had a great conversation which sparked some ideas that I plan to incorporate into the novel. The Alliance’s mission is “to preserve and restore Indiana’s native forest ecosystem for the enjoyment of all.” The Indiana Department of Natural Resources’ mantra is that “for forests to be healthy, they need to be logged” which does not support preservation of our old growth forests. Sounds like a good start for some conflict to develop! This begs the question of whether trees are sentient beings. In The Field I explore the Universal Energy Field and Collective Consciousness as they relate to the interconnectedness of humans, but what about other living (and even non-‘living’) entities like animals and plants (or the Earth itself)? Are they connected? Do plants have feelings? There is another book that looks interesting on this subject The Secret Life of Plants by Peter Thompkins and Christopher Bird. In her book, The Intention Experiment, Lynne McTaggart cites experiments by Cleve Backster showing that plants react to human intentions. Research is one of the best parts of writing. The idea that plants are sentient beings and have feelings and react to danger and human activity is super intriguing! Can’t wait to learn more and incorporate it into Indian Summer. The Indiana Forest Alliance aims to preserve forests for the enjoyment of all. In Japan, the practice of ‘Forest Bathing’ is widely practiced. Spending time in nature is scientifically proven to improve your health. I’ve even read that some physicians are prescribing time in nature as treatment. This is one of the reasons that I incorporate environmental themes in my novels. The natural world is beautiful, awe-inspiring, priceless and feeds our souls. We must be the Earth’s caretakers, not exploiters. Have you ever had a thought or feeling about something that later came true? Did you realize what it was at the time? If you had known that it was a premonition would you have acted differently? I recently had two separate traumatic occurances where I had a premonition about them beforehand. It wasn’t as though I ‘knew’ what was going to happen, more like a fleeting thought crossing my mind that I remembered after the event. The first was a car accident. I had been driving all around central Indiana a day in mid-December and was headed home. It was early evening – dark and raining. Visibility was bad and I was concerned about getting into an accident. I had a fleeting thought that I might get rear-ended, but it was just that – a fleeting thought. It occurred to me and then I moved on to other thoughts. I had been in a rear-end collision on a similar dark and rainy night in October, so I attributed it to that connection. The car in front of me stopped on the four lane, busy road to turn left. I wasn’t able to pull past her into the right lane so I waited for her to turn. After a few moments I heard a screeching sound and then BOOOOOM! someone crashed into me from behind hitting me so hard that I crashed into the car in front of me and hit my knees on the dashboard. It wasn’t until later that I remembered the fleeting thought of the rear-end collision. Could I have avoided it if I had known it for a premonition? I’m not sure what I could have done. The second premonition was about my nephew breaking his arm. Over Christmas I went to California to visit my brother and his family and to watch his two kids while he and his wife took a little ‘adults only’ vacation. My niece and nephew and I were having a great time on our ‘Auntventures’ going to museums, roller skating and going to the movies and the library – they love to read!! My brother suggested I drop them off at a bouncy-house play center on Friday evening so I could have a few hours to myself. I remember thinking – ‘Ben is going to break his arm’. Again, it was hardly even a solid thought, just a fleeting idea. I dropped them off and went into the little town to shop and have dinner. Midway through my dinner and into my second glass of wine I got the call. I thought – ‘here it is’ – before I answered. Ben may have broken his arm, they said. When I got there I was met with a fire truck, ambulance and police car all with lights flashing. He did in fact break his arm pretty badly, but I’m happy to report that the cast was just removed last week and he is healing beautifully! What if I had paid closer attention to my intuition or premonition and not taken them to the play center? Would Ben not have broken his arm? Probably. Was it really a premonition or just me thinking of a possible likely scenario? The doctor who treated him said they see kids with broken bones from those bouncy houses all the time. In The Field, Eric has frightening dreams that he doesn’t know what to do with. Is he connecting with The Field? The Collective Consciousness? Was I? What do you think? The Field Publishes April 23rd! Can we really all be connected by the same energy field, the same power, the same consciousness? As Eric Horton learns more about these concepts – in his science classes, from the experiments his girlfriend’s father is conducting, even through his own bizarre experiences on the soccer field he still finds it all hard to believe. But he must open his mind to all the possibilities before him if he is to succeed in saving what he could never forgive himself for losing. I completed the first draft of my next novel titled Catalyst! Now on to revisions. But I’m going to savor this moment for a little while. More adventures with Marcie and Eric Horton. This time they are fighting Fracking in southern Indiana and much, much more! Excerpt from The Field when Eric and Renee are discussing how ‘thoughts are things’ and the Akashic Record. “But everyone knows that thoughts can turn into something real. First you have an idea, then you act on the idea and then it’s real.” I know this isn’t what she really means, but I just can’t help playing devil’s advocate. “The Collective Consciousness is all of the thought energy from everything in the Universe, like an underlying current of energy connecting everything together, and the Akashic record is like a vast library of all the thoughts and information that every existed or ever will exist.” She stops and looks at me for my reaction. I look down at her hand still clasped in both of mine. Her nails are perfect ovals and the skin covering the tiny bones and muscle and sinew that make up her hand is smooth and unblemished. I am reminded of how amazing even the things we take for granted really are. The human hand is at once beautiful and miraculous. It’s miraculous that we even exist at all, really. That the world exists. How different is it to consider that there could be truth to what she’s saying? Thoughts are things. Currents of energy. A library of thoughts. Eric and Dr. Auberge discuss the Collective Consciousness in The Field. “What’s that?” I feel like The Twilight Zone theme song should be playing in the background. “It’s called many things; the Akashic Record, the Universal Field of Consciousness, and by some, God. Many Eastern religions believe that we are all connected to each other and to what you could call God or higher consciousness by our thoughts and that thoughts have power, or even energy. Science is just now recognizing the power of thought. As you said, visualization is used frequently in sports, but there is much more to it than that.” I’m thinking that I am in store for a really out-there conversation with Dr. Auberge, but I’m saved when Renee comes into the kitchen and puts her hand lightly on my shoulder. I didn’t hear her come in so it startles me a little. The conversation with Dr. Auberge was getting pretty intense. At some deep level it resonates with me, but at the same time, thinking that there’s a Universal Field of Consciousness seems straight our of a science fiction movie. It’s hard to believe it could actually be real. But what kind of spiritual means? In my novel, The Field, the main character is connecting to the collective consciousness or The Universal Energy Field, what you might envision as the thought energy of every human being, and possibly every other kind of being, in our world and in the Universe. This energy connects us all to one another and connects us all to God, or The Divine, because it is part of God just as God is part of us and in everything in the Universe. Lynne McTaggart talked about it in her non-fiction books entitled The Field: The Quest for the Secret Force of the Universe and The Intention Experiment: Using Your Thoughts to Change Your Life and the World. We learned about it in the movie The Secret but the movie didn’t focus strongly on the important element of spirituality. In essence – our thoughts are powerful when used with a spiritual focus. Studies have proven that prayer can affect the health outcomes of cancer patients. Even if they are prayed for by someone who doesn’t even know them. In McTaggart’s book The Intention Experiment, she gives multiple examples of situations where thoughts and intentions actually change events and outcomes. Other studies have shown that our fights against things – the War on Drugs, the War on Poverty, the War on Terror, campaigns against bullying – actually cause those problems to increase! As Mother Teresa said “I will never attend an anti-war rally; if you have a peace rally, invite me.” What you focus on becomes your reality, so we need to focus on what we want, not what we don’t want. So that brings me to what you can do to help change the world. I know that many, many people want to have a positive impact, but feel powerless or don’t know how. You are more powerful than you know. Your thoughts have power when combined with spirituality. Pray for peace. Meditate for wisdom for our leaders. Envision prosperity and universal love. Pray for healing for the Earth. Ask for help from Divine Source in raising your consciousness. Find other spiritual seekers and connect with them. Now is the time. We are awakening. Blessings to you all. I’m about a quarter of the way through with the very rough draft of my next untitled novel. Titles are really hard and I’m hoping for some inspiration to strike somewhere in the writing process! As in my other books there is an environmental theme. I’m very concerned about what humans are doing to our planet with pollution, nuclear radiation, fracking, and burning fossil fuels. There is a lot of evidence that what we do harms the planet and I believe that there is a limit to what the Earth can absorb of our throw-away culture. There are better, healthier alternatives to plastic waste, pesticides and chemical fertilizers, and fossil fuels. Don’t even get me started on antibacterial soap! Antibiotics are turning up in mountain stream water! We just have to show a commitment on a personal level. What you do does matter. Corporations and governments won’t change of their own volition. They change in response to economic pressures – buying habits of consumers – and public pressure – how we vote. My way of showing my commitment is to include these issues in my books interwoven with stories of normal teens. In THE FIELD the characters learn about and interact with The Universal Energy Field and the Collective Consciousness. This book will have aliens. Or star-beings, or extra-terrestrials – whatever you want to call them. If you think about the vastness of the Universe – billions of galaxies, billions of stars with billions of planets – I think it is naive, and really arrogant, as well, to assume that we are the only form of intelligent life out there. Or that we are the most advanced form of life. These other life forms could be so advanced that they could already be here without our knowledge. At least the knowledge of the general population. There are certainly enough UFO sightings by credible sources such as airline pilots and military personnel to make one wonder about it. A lot of books and movies about aliens have them attacking Earth. Then there are movies such as Interstellar, ET, Contact, and Close Encounters of the Third Kind. What if that is the truth? What if star-beings don’t mean to harm us, but want to help us? Are we ready to accept their help? Here are some sites with more information. The idea behind The Field came from several different places. The first influence was metaphysical. We all experience it. The hunch that turns out to be true, running into a friend that you were just thinking about, the answer to a question you were pondering popping into your head or an eerily prophetic dream. I wanted to tell a story about a regular person, a normal person, who was having these types of experiences. Most of the YA paranormal stories that I read are about teens who are extra-ordinary in some way. They have special powers that no one else possesses. In The Field, Eric is an ordinary high school soccer player who is experiencing something more. He’s connecting to The Universal Energy Field and the Collective Consciousness; something that I believe we all can do. The second influence was all of the disaster, post-apocalyptic literature out there. I like a good dystopian story as much as the next person, but I was starting to feel as if all we could see in the future was doom and gloom. I’d like to think that we are better than that. Certainly bad things happen and bad people exist, but why not focus on what is good? It doesn’t have to be sappy or boring, either. And it isn’t necessarily easy. Eric struggles with figuring out how to tap into The Field, how to play well in the goal, and in his relationships with his girlfriend and best friend. And it doesn’t end with him having all the answers. The process is what matters and what he learns is that he’ll never know everything and that it’s not important. He just needs to know that there is something more out there than we experience, if we just take the time to pay attention. Environmental issues play an important role in my writing as well. I have a degree in biology and while I didn’t pursue science as a career, I am still very influenced by it. The earth is our home and I believe that we should take care of her. We live in a throw-away culture, not thinking about how our plastic bottles or lawn fertilizer will affect the world around us. I think the time is fast approaching when we’ll have to take notice. Really, it’s already here. In The Field I focus on so-called ‘Clean Coal’ and to some extent nuclear energy and compare them to other truly clean energy sources such as wind or solar and then I take it a step further. What if The Universal Energy Field is a source of energy that we can tap into? How would we do it? What is it? I don’t mean to claim that I have the answers, but there are brilliant scientists who are trying to find those answers. Again, it comes back to my belief that there is so much more in the Universe than we perceive or even imagine. Exploring these ideas through the vehicle of story presents a unique opportunity. In fiction, I can make things up (which I love), but I can also present new ideas in a way that is more accessible and approachable. I hope that my books allow people to look beyond what they think they know is true, and, hopefully, give them a really good story to enjoy while they’re doing it. My Goodreads Advance Review Copy giveaway for THE FIELD is open! It will run from Tuesday, June 18th until Tuesday, July 9th. I’m giving away 20 copies (yes, you read that right, 20 copies) in exchange for a review posted on Goodreads. SIGN UP TO WIN! One of my friends always says “Free is Good” and so is getting a copy of THE FIELD before everyone else! This is a picture of deep space taken by the Hubble telescope. Scientists pointed it at a place in space the size of a grain of sand held at arm’s length that they thought was EMPTY and left it to gather light for a week to see what they would find. 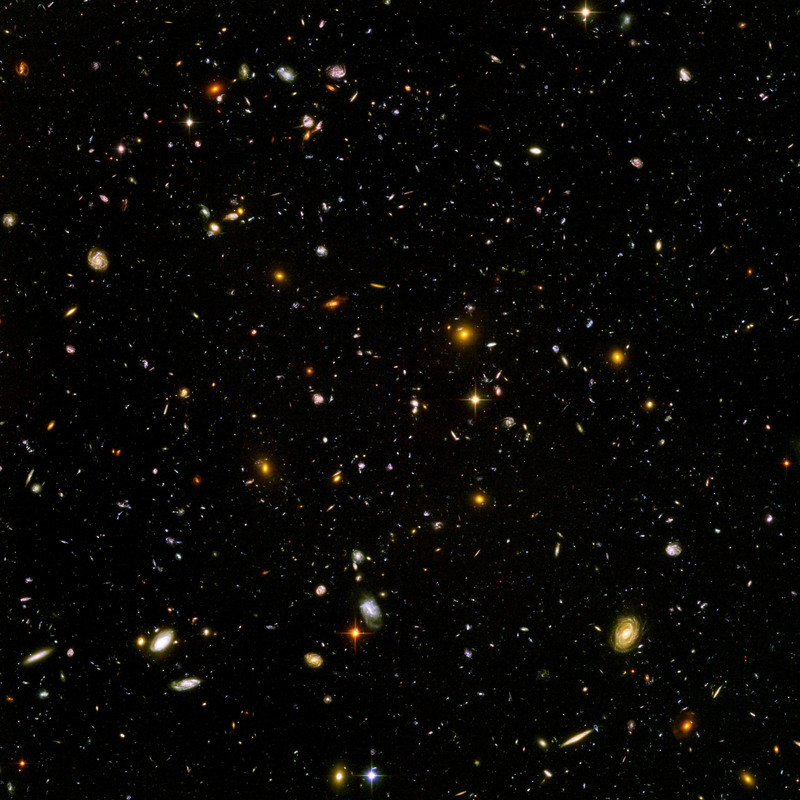 What they found was over 10,000 galaxies. These points of light aren’t just stars, they are GALAXIES each composed of billions of stars. In a point the size of a grain of sand. Mind Blown. In THE FIELD I explore the idea that there is much more out there in the Universe than we can see or even fully understand. To set up the scene – Eric is over at Renee’s house for a ‘homework date.’ She’s not ready yet, so he has to hang out in the kitchen with her father, Dr. Auberge, a prominent physicist who’s running thought experiments that Eric has participated in. “Okay, I need to clean up my paint and brushes. I’ll be down in a minute.” She replies from somewhere on the second floor. “Come back to the kitchen. No telling how long a minute could be.” Great. One-on-one time with dad. You’d think that I’d jump at the chance to get in good with him because of the internship, but I’m pretty sure that dating his daughter isn’t one of the selection criteria. Might even count against me. “Would you like something to drink? Water, soda?” asks Dr. Auberge. “No, thanks, I’m good.” I find a spot to stand by the kitchen table and try not to look too uncomfortable. Here’s the enhanced consciousness again. “Uh, what do you mean?” I stumble out. Not the direction I expected the conversation to go. “Well, usually for subjects who have a high score initially, we find that it’s not the first time they’ve experienced enhanced consciousness. It might be that they have premonitions or maybe coincidences occur frequently for them. Or it could be more like feelings of deja-vu or dreams or that they are more perceptive of the feelings of people around them. Most likely other things, too, that they aren’t even fully aware of.” I just stare at him for a minute. I think my mouth might even be hanging open. “Is that true for you?” He looks at me inquiringly. It’s as if he knows something about me that I didn’t even fully recognize myself. I’m a little apprehensive, but also curious. Cautiously I say, “Yeah, I guess I’ve had some of those things happen, but I’ve never thought much about it,” I try to shrug it off. “What sort of things do you experience?” He’s leaning back in his chair, apparently having a casual conversation, but the way he’s focused on me makes me think that he’s intently listening. I figure I might as well tell him about the soccer stuff. “It’s called many things; the Akashic Record, the Universal Stream of Consciousness, and by some, God. Many eastern religions believe that we are all connected to each other and to what you could call God or higher consciousness by our thoughts and that thoughts have power, or even energy. Science is just now recognizing the power of thought. As you said, visualization is used frequently in sports, but there is much more to it than that.” I’m thinking that I am in store for a really out-there conversation with Dr. Auberge, but I’m saved when Renee comes into the kitchen and puts her hand lightly on my shoulder. I didn’t hear her come in so it startles me a little. The conversation with Dr. Auberge was getting pretty intense. At some deep level it resonates with me, but at the same time, thinking that there’s a Universal Stream of Consciousness seems straight out of a science fiction novel. It’s hard to believe that it could actually be real.